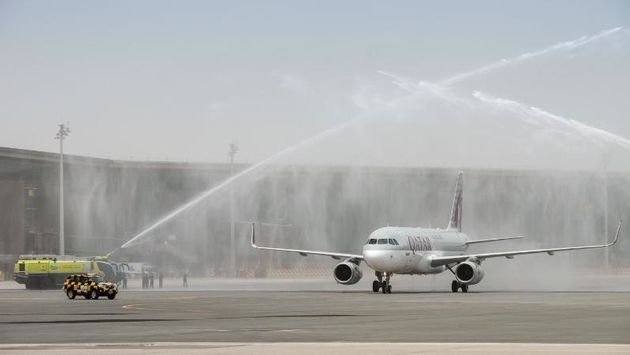 PHOTO: The first flight out gets the customary water hose shower in Qatar. THE PULSE: Hamad International Airport in Qatar begins service. Qatar's new Hamad International Airport (HIA) extended its jetways today to welcome arriving passengers for the first time to the world's newest aviation hub. A press conference was held earlier today at the HIA passenger terminal to mark the soft launch of the airport. The event was attended by HE Mr. Jassim Saif Ahmed Al Sulaiti, Minister of Transport, members of the New Doha International Airport (NDIA) Steering Committee, guests and members of the press. A Qatar Airways flight was the first to officially land on the East Runway. The flight carried the Minister of Transport, the board members of the Steering Committee of NDIA and other delegates and received a Water Salute by the Qatar Civil Aviation Authority Rescue Fire Fighting Services. Starting today, ten carriers commenced operations out of the new passenger terminal at HIA, with the remaining carriers, including national carrier Qatar Airways, expected to move to the new airport by May 27 2014. "HIA is a world-class aviation hub purpose-built to cater to rapidly evolving aviation and passenger needs of the 21st century," said H.E. Mr. Abdul Aziz Mohammad Al-Noaimi, Chairman of the NDIA Steering Committee. 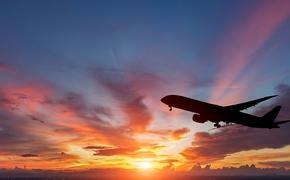 "In fact, its capacity on opening day will be 30 million annual passengers, which is more than the initial plan. Initial capacity was expanded to accommodate the increased transit growth in Qatar over the course of the past decade," he added. HIA and Airport City (together comprising the NDIA project) span 29 square kilometres, 60 percent on land reclaimed from the Arabian Gulf. The project includes 100 buildings of various uses. The Passenger Terminal features a massive internal area of 600,000 square meters and has 3 concourses and 33 contact gates, which will subsequently be increased to five concourses and 65 contact gates, including eight for the A380, in the final build-out. Once fully open, the terminal also features 16 lounges, 26 art installations, more than 100 F&B and retail outlets, a transit hotel, a swimming pool, a luxury spa, squash courts and a four-storey catering facility that is one of the largest in the world. The on-site public mosque can accommodate 500 worshippers at prayer time. "The launch of the new airport represents the fulfilment of the longstanding vision of His Highness SheikhHamad bin Khalifa Al Thani, the Father Emir, which was brought to fruition by His Highness Sheikh Tamim bin Hamad Al Thani, the Emir of Qatar," said Al-Noaimi. "HIA will be a source of pride and joy for all people ofQatar for many decades to come. It will deliver a memorable experience to all passengers that will travel through its gates; an experience that reflects Qatar's status and importance on the world travel and tourism map."